SANTA ROSA BEACH Florida (Reuters) - Mike Huckabee bought a beachfront lot here in 2009, a year after his failed bid for the Republican presidential nomination. A longtime friend and political ally of the former Arkansas governor bought the lot next door. They planned to build $3 million vacation villas side-by-side, each with a pool and sweeping views of Walton County’s renowned sugary sand beaches and the azure waters of the Gulf of Mexico. The only hitch was that their lots lay on a severely eroding beach. Under state regulations, they couldn’t build on the seaward side of the sand dune nearest to the surf. And after seven hurricanes in six years, the surviving “frontal dune” sat too close to the street to allow space behind it for the friends’ 11,000-square-foot (1,020-square-meter)compounds. The structural engineer they had hired knew what to do. He dumped truckloads of sand farther out on the beach, shaped it into a mound, and declared the man-made hump to be the new frontal dune. When staff at the Florida Department of Environmental Protection (DEP) still balked at issuing the necessary permits, the engineer asked Michael Sole, head of the agency at the time, to intercede. The decision: Huckabee and his friend would nudge their home sites back 5 feet (1.5 meters). The permits were approved. Construction wrapped up in 2011. Accommodating the two politicians was nothing out of the ordinary. The way they got their permits is standard operating procedure along much of Florida’s besieged shoreline. “I can’t think of a single project that I’ve done here in the last 12 years that’s been denied a permit,” said Terry Anderson, Huckabee’s engineer. He acknowledged that his winning record has depended on the occasional intervention of top DEP officials. Such interventions are needed to temper the sometimes “over-zealous” permitting staff, said Danielle Irwin, the DEP’s deputy director for water resource management. The ease with which Huckabee and his neighbors have been able to work around some of the most restrictive beach development laws in the country is indicative of a problem that only worsens as rising seas gnaw at U.S. shores: Americans are flocking to the water’s edge, as they have for decades, even as the risks to life and property mount. And government is providing powerful inducements for them to do so. Between 1990 – when warnings were already being sounded on rising sea levels – and 2010, the United States added about 2.2 million new housing units to Census areas, known as block groups, with boundaries near the shore, a Reuters analysis found. The analysis did not include Louisiana, Hawaii or Alaska. That 27 percent increase is in line with growth nationwide. But it occurred in block groups near some of the country’s most imperiled shores, sometimes at much higher rates. Florida’s 1,350 miles (2,173 km) of shoreline – the longest in the contiguous 48 states – accounted for a third of new coastal housing built. Huckabee’s house was one of 22,000 housing units added to block groups near Walton County’s shoreline since 1990, a 186 percent increase. The number of people living near the Florida seashore has jumped by about 1.1 million since 1990, to 4.8 million – an increase more than four times greater than in Washington, the state with the next highest increase. And Florida’s increase doesn’t count part-time residents who spend their winters in the state. “There’s not much [privately owned coastal property] in Florida that’s not developed,” said Tom Tomasello, a former DEP lawyer. He is now among the many lawyers, consultants and engineers who offer their services to help homeowners get permits from his former employer. Florida also approves most applications for bulkhead and seawall permits to protect shoreline development. Reuters found that the state has issued more than 300 since 2005, an approval rate of 79 percent. Seawalls come with a price to the public: They deflect wave energy that then scours the beaches in front of them. Irwin, who headed a firm that helped clients obtain environmental and coastal construction permits before she joined the DEP in 2012, said the approval rate is high because the department works with applicants to reduce the impact of shoreline structures, and must approve them if they meet the law. “Any brakes on development would have to come through the legislature,” she said. The state accounts for about a quarter of the roughly $7 billion spent on sand projects nationwide, in current dollars, according to Andy Coburn, associate director of the Program for the Study of Developed Shorelines at Western Carolina University in Cullowhee, North Carolina. Federal taxes covered about three quarters of the cost; state and local government paid the rest, minus a small share contributed by private landowners. Congress this session approved five new sand projects that will require an estimated $400 million in federal help. Among them: Replenishment of the 19-mile stretch of beach that passes Huckabee’s vacation house, with $43 million in federal subsidies. In towns and cities all along the Gulf and Atlantic coasts, the sight of dump trucks laden with sand or dredgers pumping a sand-laden slurry through pipes onto beaches has become the norm. Panama City Beach, a resort town on the Panhandle, has had its beach reconstructed three times by the U.S. Army Corps of Engineers: in 1998, after Hurricane Opal wiped the sand clear back to the sleepy, low-rise hotels at the water’s edge; in 2005, after Ivan, Dennis and Katrina slammed into the high-rise condos that had replaced the old hotels; and in 2011, when one million cubic yards of sand was added to the beach to keep pace with erosion. Cumulative cost: $54.5 million. The taxpayer largess doesn’t end there. Federal disaster recovery assistance has exceeded $124 billion since 2004, according to a May 2014 study by the Congressional Research Service, mostly for damages caused by hurricanes. And many of the houses, condominiums and resorts that line the storm-battered beach are covered by federal flood insurance, a subsidized program that took up the slack when private insurers fled the state after Hurricane Andrew inflicted huge losses in 1992. Florida is the program’s top customer among states. It has two million policies, many of them charging below-market rates, insuring $484 billion in property. All that money creates what many people familiar with Florida’s predicament characterize as a costly – and dangerous – system of socialized risk to indulge beach lovers. “It’s an unsustainable model that encourages development and leaves people in harm’s way,” said Steve Ellis, vice president of Taxpayers for Common Sense, a Washington-based nonprofit budget watchdog. The scenery along coastal Highway A1A between historic St. Augustine and metropolitan Jacksonville has changed a lot since Walter Coker moved to the area in 1990. Driving his battered pickup on the highway one recent sunny day, Coker, a surfer, photographer and owner of an import business, pointed to a boxy new house on a dune where he used to lead his daughter on a path through scrub oak and sea oats to the beach. This 18-mile stretch of Atlantic coast was undeveloped when the highway opened decades ago. Now, more than 400 houses line the shore of what is, like so many heavily developed areas in Florida, a barrier island whose natural function is to protect the mainland from the sea by bearing the brunt of storms and high seas. “For Sale” signs top undeveloped lots on the narrow dune between the highway and the shore. The evolution of the shoreline here and all around Florida reflects powerful incentives to pursue seaside development. Local government budgets depend on property tax revenue, and beachside properties are cash cows. Tourism generates state sales tax revenue and jobs. In St. Johns County, where the attractions include 450-year-old St. Augustine and 42 miles of beaches, tourists spent more than $700 million last year, and real estate taxes accounted for one-fifth of the county’s budget. A Reuters analysis found that about 34 percent of the county’s taxable property value is located within about one-eighth of a mile of saltwater shores. Walton County’s coast was a rural landscape of rolling green dunes and sugar-white beaches when Florida lawmakers approved new restrictions on coastal development in 1978. It was a place where “there were more dogs than full-time residents,” wrote local historian Edmond Alexander. Storms regularly scoured the coast. The beaches responded as beaches untouched by man do: They retreated and regenerated. Today, a 20-mile wall of villas and resorts pushes right up to the edge of the last dune before the surf. With nowhere to go, the beach – a stretch of rare fine-grained sand that’s almost pure quartz – has been disappearing as summer storms have worsened. Their erosive effect has been compounded by a separate phenomenon: The normal seasonal increase in sea levels during summer months has intensified along the eastern Gulf Coast since 1990. Scientists aren’t sure why. A recent study by researchers at the University of South Florida in St. Petersburg found that this trend has doubled the impact of long-term sea level rise on surges during summer storms. During that period, hurricanes and tropical storms have resulted in 10 federal disaster declarations in Walton County. The worst, Hurricane Ivan, flung 15-foot surges against the Florida coast in 2004, causing an estimated $8 billion in damage and killing more than a dozen people. When Dennis crashed to shore the next summer, there was too little beach left to stop the waves from grinding away the dunes under the big villas. Rooms and pool decks hung in midair. The storm caused more than $1 billion in destruction and two deaths in Florida. Katrina passed to the south a month later, taking a little more of the beach. 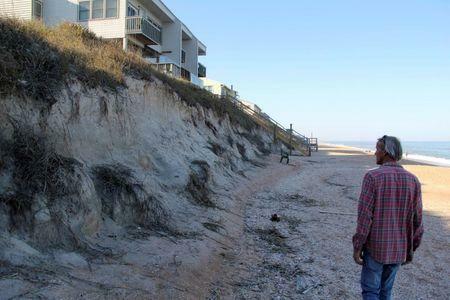 A state report on the aftermath said the storms left homes on a stretch known as Blue Mountain Beach “critically imperiled” by severe erosion. A photograph of the damage shows two battered houses clinging to a 20-foot-high ledge where the storm had sheared off a large dune. The property on the right was sold four years later to Mike Huckabee and his wife for $800,000. Former Arkansas state Representative David Haak and his wife paid the same for an adjacent undeveloped parcel. But their plans to build vacation homes ran up against state laws and regulations meant to curtail high-risk development on the state’s beaches. Their lots rested directly atop the “Coastal Construction Control Line,” a state designation marking how far inland the surge from a 100-year storm might reach. Property touching it cannot be developed without a special permit. Terry Anderson, the engineer hired to shepherd the project through the state permitting process, told Reuters that he seized on two maneuvers responsible for much of the new construction in risky areas. First, he began by trucking sand to the beach to create a manmade frontal dune closer to the water. 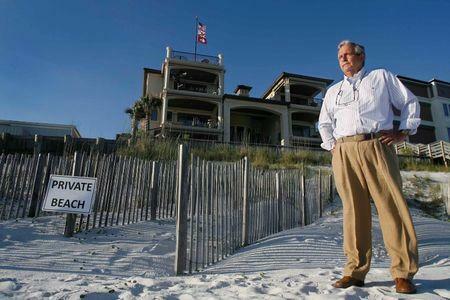 “I’ve done this in many cases,” said Anderson, who opened his firm in Santa Rosa Beach 12 years ago. He then aligned the footprints of the two proposed houses with the rest of the houses on the beach. Huckabee and Haak should be allowed to place their homes as close to the water as everyone else, he said, even though the terrain and risks may have changed since the older homes were built. DEP staff responded that the artificial sand dune Anderson had built didn’t offer enough protection to the homes or the beach. Eventually, they were willing to approve Huckabee’s house if Anderson built it 5 feet closer to the street. But they insisted that Haak’s house be built 30 feet back, citing differences in the condition of the lots. “It would have completely destroyed the architectural footprint,” Anderson said. Sole, secretary of the Department of Environmental Protection from 2007 to late 2010, sided with Anderson. The permit was issued with each house moved back 5 feet. “Sometimes it does take ... appealing to higher authority maybe to get some consideration for more common sense views of a particular situation,” Anderson said. Sole, now vice president for state government affairs at Florida Power & Light Co, declined to comment. Florida’s coastal development restrictions have not stopped development as much as they have made it more expensive, Anderson said. A coastal construction permit with no complications may cost upwards of $50,000 in state, legal and engineering fees. Huckabee and Haak paid a reduced rate of about $50,000 total because their sites were developed together, he said. Taxpayers pay, too. 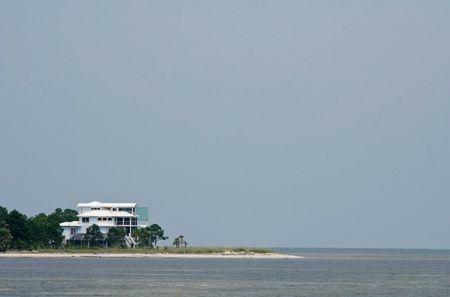 To protect the growing number of expensive vacation homes on the shore, Walton County applied more than a decade ago to the Army Corps of Engineers for federal assistance to widen its beach and to replenish the sand for the next 50 years. To qualify, the county had to prove there was a national economic interest that exceeded the cost of the project. The Army Corps found there was, and Congress approved the project in May. One of the most significant benefits cited in the Army Corps’ analysis: potential savings in hurricane damage, much of it paid by the federal government through insurance and disaster assistance. The replacement value of the buildings and their contents that would be protected, $1.1 billion, helped nudge the project past the break-even point for economic benefits per dollar spent.